Amazing prop replica knife from The Expendables 2! Designed by master craftsman Gil Hibben. Own a piece of The Expendables 2! It's an awesome prop replica knife from The Expendables 2! 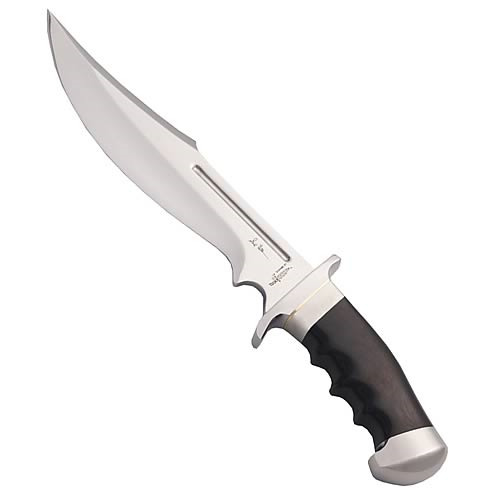 This excellent Expendables 2 Legionnaire Bowie Knife Prop Replica is a full-sized prop replica knife, made out of high-quality stainless steel. The Legionnaire Bowie Knife features a 9 1/2-inch long blade with a mirror-polished finish, plus, the handle is constructed of black pakkawood and is accented with a mirror-finished, solid stainless steel guard and pommel. The knife includes a classic leather belt sheath with stamped Hibben logo and certificate of authenticity. Measures 15-inches overall. Gil Hibben has a history of designing knives for Sylvester Stallone to feature in his films, going back to the Rambo III Bowie. Stallone commissioned Gil to make several knives to use in The Expendables and The Expendables 2.